A chill is settling in Monday as the cherry blossoms finally hit peak bloom. Temperatures hovered just above freezing before sunrise with wind chills in the 20s. Monday's high is 52 degrees — about 10 degrees below average. It will also be windy. There's some good news: Even though it's cold, there will be plenty of sunshine all day. The National Park Service announced on Monday the official beginning of peak bloom, meaning 70 percent of blossoms on Yoshino cherry trees will have opened. The cherry blossom trees around the Tidal Basin are now in Stage 4 of 6. 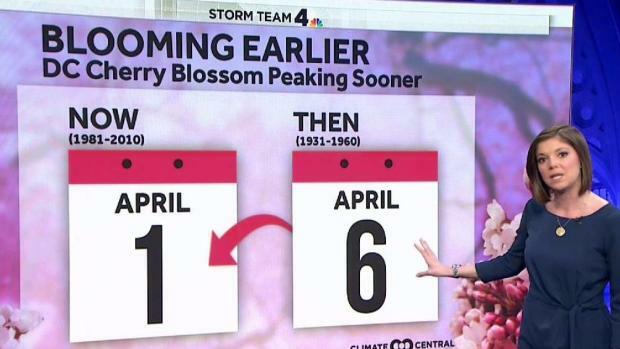 Storm Team4's Amelia Draper explains why the peak bloom date for the blossoms has moved up throughout the years. Windy conditions and cold don't bode well for the cherry blossoms, but it looks just mild enough to allow peak bloom to flourish. 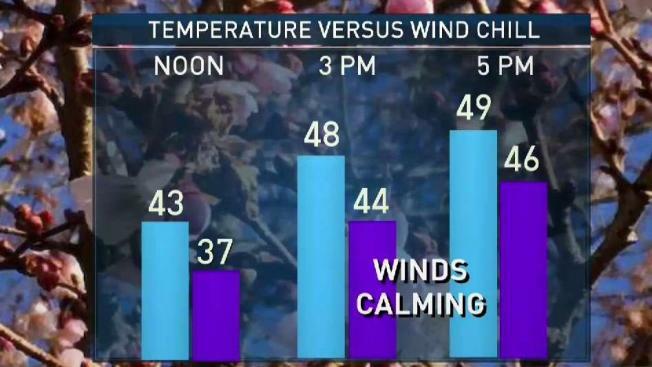 The petals begin to fall off the cherry blossoms at about 27 degrees, and thankfully it likely won't get that cold, Storm Team4 Meteorologist Lauryn Ricketts says. Downtown D.C. and the Tidal Basin are forecast to stay above freezing. Gusty winds could send petals swirling off, but don't cancel your bloom watching plans. "It's not like they're all going to fall off," Ricketts says. Winds die down Monday night. The National Park Service says peak bloom can last 7-10 days, but Storm Team4 is tracking some trouble-causing weather patterns. Storms are possible Tuesday afternoon, and heavier rain showers with strong winds are possible on Friday.